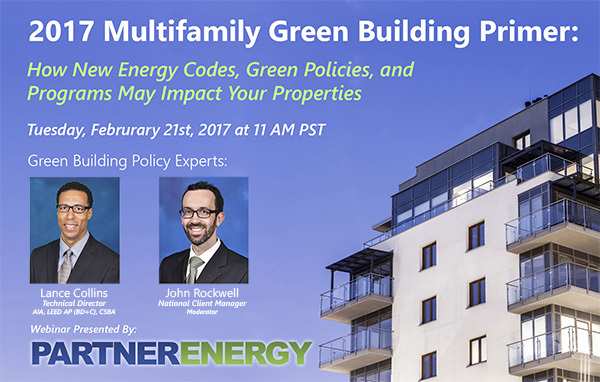 Please join us on Tuesday, February 21st for our 2017 Multifamily Green Building Primer Webinar! Net-Zero (CA 2020 Goals) and More! How New Energy Codes, Green Policies, and Programs May Impact Your Properties. Missed the Webinar? View the presentation here. This entry was posted in News and tagged Energy Efficiency Regulations, Webinar by Partner Energy. Bookmark the permalink.